Hot and sweet. Sweet and Hot. Picoso y dulce. However you say it it is spicy hot and sweet. It is a very interesting combination. I truly was not prepared to like this jelly but it now goes to the top of my list of favorite jellies. I actually put off making this recipe because everyone made it sound formidable to make. True, it was a little more uncomfortable to make than some but it turned out pretty good. 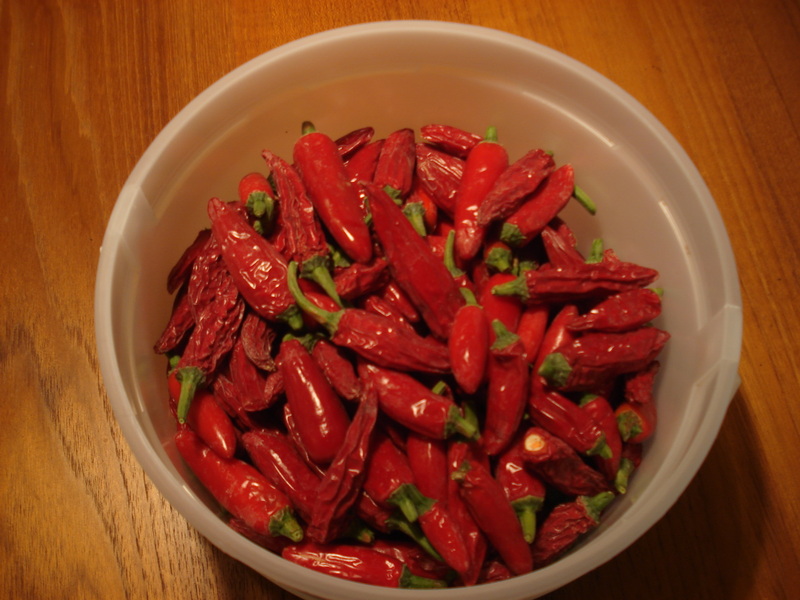 I had four potted plants full of green and ripe red serrano chiles that kept staring at me like a beacon. I knew these guys were hot but not how hot until I bit into one of them. Yes, they were definitely hot enough for a hot spicy jelly! I picked them, but first sliding on a pair of surgical gloves. I picked and picked until I had so many chiles that my allergies were forgotten. I sorted the chiles into groups of red chiles and green chiles. I then proceeded to wash them, and then remove the seeds (with the gloves still on). Well, they were so spicy I had to take them outside to work on because of the fumes emanating from them. Tears were streaming down my face by this time. I began to worry that this might be a mistake but I soldiered on. After accumulating a 3/4 cup of each I stopped removing the seeds. 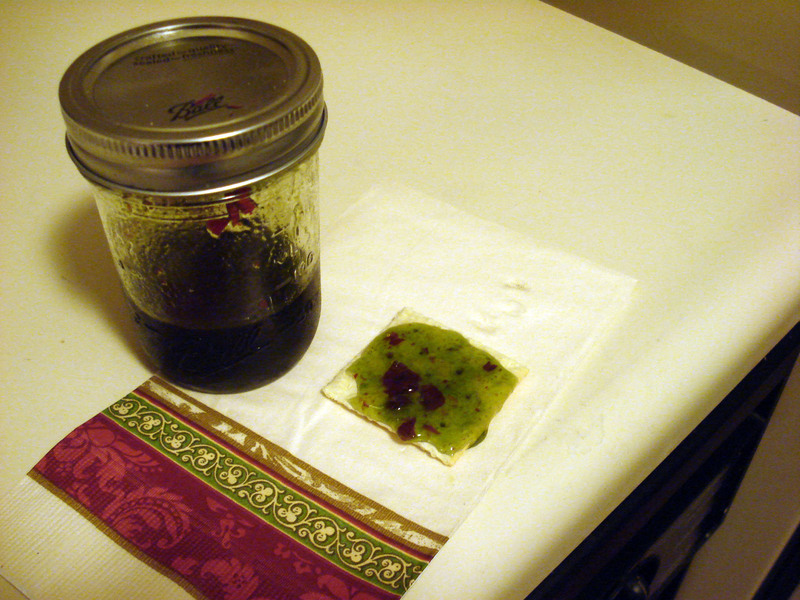 I still had lots of chiles but two batches of this jelly seemed like enough tear inducing work. The rest of the chiles I resolved to let my wife give away the next day. I put the chiles in seperate zip lock bags and put them away for the day. The following day I got the chiles out of the refrigerator. I had looked up recipes for hot jellies but did not find one I liked so I decided to invent my own. It may sound ok to create your own but all the while in your mind you wonder if the jelly will be too hot or if it will jell. All of the recipes I found strongly suggested that one use liquid pectin but I prefer the no sugar dry pectin so I was determined to give it a try. After chopping the chiles up in the food processor with a cup of vinegar I thought I was ready. When I placed it into the pot to cook I realized that the pieces of chopped chile still were too big. I removed them and chopped them once more. I returned the hot fruit to the pot and added more vinegar. I then added the sugar. The tears were forming in my eyes again so I turned on the vent of the stove. That helped a lot. After cooking the chiles for ten minutes I added the pectin, boiled them for another minute. I then took them off the stove. When cooled the jelly was poured into the freezer containers. I let the jelly cool then put it into the refrigerator overnight. Was I ever amazed and impressed when I discovered that not only had it gelled but tasted great. It was hot, of course, but the sweetness made it very palatable. The serrano jelly was a success. Remove seeds from peppers (with gloves on). Rinse off any stray seeds. 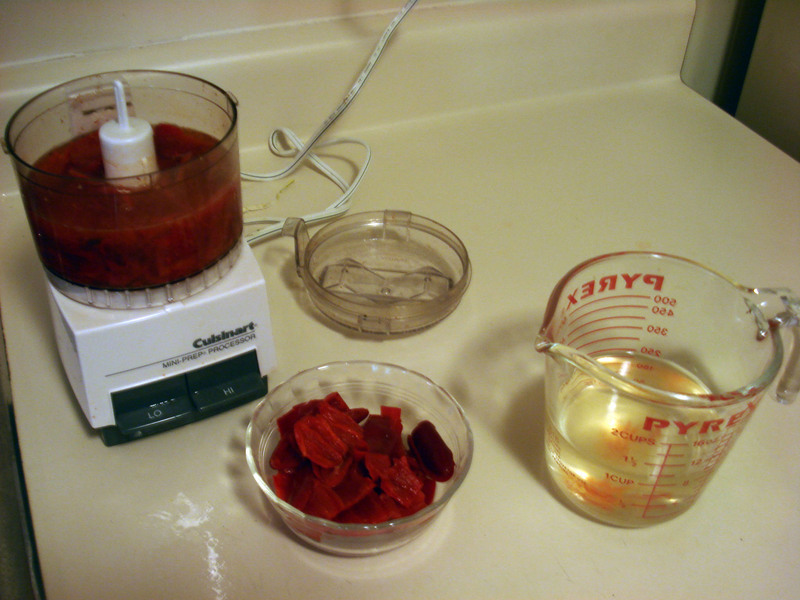 Place in food processor with a cup of vinegar. Heat up the chiles and vinegars until it boils then add the sugar. Then when the contents return to a full boil add the pectin and boil for 1 minute. Cool and pour into freezer containers. I was worried it might be too hot but it is hot enough that when you are finished you know that it was a hot chile but not so hot you are looking for something to wash the heat away. I even ate it directly from the spoon without the cracker and declared it perfect. Gallery | This entry was posted in Recipes and tagged hot pepper jelly, hot pepper jelly with dry pectin, jalea de serrano, jalepeno jelly, serrano jelly, spicy jelly. Bookmark the permalink. Wow, this one sounds fun (to eat, not to make)! How much pectin is “1 pkg”? I only found it in 1.75 oz boxes and much bigger jars (like 6 oz or so). Thank you. Paul- Yes, the 1.75 oz is what I refer to as 1 package of Low or no-sugar needed pectin. It contains 3 tablespoons of pectin. I do find that having 4 tablespoons of pectin gives a firmer texture. I like to buy the 4.7 oz jar where I can spoon out the amount I need. When you list the amount of peppers: is that whole peppers, seeded peppers, packed seeded peppers??? Your recipe says low or no sugar pectin but it calls for 5 cups sugar have you used sugar sub and what kind??? Marabella- Thank you for your excellent questions. The peppers indicated are 3/4 cup of packed whole peppers with the seeds removed. In regards to the sugar in the recipe I needed to add more regular sugar because I had used vinegar. In my other jelly recipes I use 3 cups of regular sugar (or less depending on taste). The No Sugar Needed packages do include directions for using sugar substitutes but I have not tried those substitutions.